Does anyone still do the Traditional Bow Camp in Colorado? In 2010 I was blessed to be a part of with Robert Smith a.k.a. Crossed Arrows and his son Chris Longbowsmith. I would love to do it again. I envy you guys. I waited too late in my life, I was in my 50's the first time out west. Wish I had done it 20 years earlier. That fella on the right is an SF guy with a HALO Jumpmaster t-shirt. You were hunting with good people. 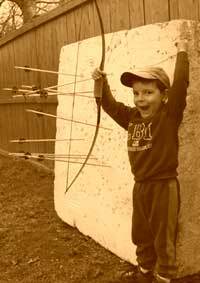 Fortunately for me I was stationed in Colorado Springs and hunted in Taylor Park back when it was an over the counter archery zone. I'm trying to get back out there one of these years. It was a fantastic time. My Brother and I traveled to Silt Colorado for a shoot..It was so Much fun Great people..
T4 that is Gilbert Mag Magalanes. He was with ODA 574 and the 1st TBI tramatic brain injury in the War on Terror. He is one of my greatest friends. The Trad hunt has not been held for may years...Dave Pohl and I did it alone for several years, but he had to give it up to manage his farm in Wis. I still go each year with a friend or two, but my nephew and I are the only Traditionalist. It was a great time, we need to get together again. Yes we do Stick. It was an amazing time for the attendees. Seeing the beautiful mountains, elk, moose and bears. I plan on going back next year. Andy, I might have met Gil years ago. Probably at a school at Ft Bragg. He looks very familiar. I had 051 and was fortunate enough to be picked to go in early. Quite an honor. Tell your buddy to shoot'em straight and I hope he's doing great. Mike, Taylor Park is amazing, I can't believe it is a draw area now. I played all over that area while in 10th GRP. You could watch the elk come down the mountain right before sun up to water and head right back up to tree line. I need to get back out there. T4, yes you do..Colorado like all the western states has changed, and who knows what the hunting will be like in a few years...by the way, I was at Bragg also...1/17 Cav.82nd. Ft Bragg, what a place. Hope I never have to go back...Ha!! I grew up in 7th GRP and loved the unit. Hated Ft Bragg! That's why after being a HALO instructor I didn't go back. Ft Carson like FT Wainwright are hidden gems. To be honest I might make it back in late September. I have a 16'x20' wall tent and GP small, both with stoves, packed in an old snowmobile trailer ready to go. It's my U.P. blackpowder camp. It's 1200 miles one way for me to where I want to hunt in Colorado. Diesel is still pretty reasonable. $660 for out of state license isn't to bad since you can shoot Bull or Cow and get a fishing license. I don't know, we'll see. Great. Long haul for me too, I'm in va. about 1650 miles to where we hunt...hey one of my best friends was SF halo...ssg Steve Wooldrige...from Bedford, Va. Sold him my Harley when I left Bragg in the spring of 1980. Is this different than the DIY CO hunt they had as little as 4-5 yeas ago? I almost went on that one, but I drew something instead. I think they had quite a few Wallers meeting out there. I keep telling my son him and his buddy's should do it , and don't wait until until they get older. I wish I would have. "I waited too late in my life, I was in my 50's the first time out west. Wish I had done it 20 years earlier." "I envy you guys. I waited too late in my life, I was in my 50's the first time out west. Wish I had done it 20 years earlier..."
I waited until I was 45. Wish I had started at 25 but it's never too late to just go. I'll have an elk camp again this year and have invited several good friends and my son who will all be hunting with compounds. I'll have my trusty Adcock takedown. My goals are to see some elk, lose 10 lbs. and forget I own a cell phone. Same as every year. And they’re even BIGGER when they’re dead! But worth every drop o’ sweat! Gil is doung good, live right near him. We shoot a good bit here in Tenn. I see him all the time. Great news. Glad he's doing well. HedgeHunter if you see him, tell him Andy Graves aka Buckshot is gonna call him this weekend. Hey folks if you guys will send me email addresses, I have some information about the yurts out there. The state is trying to take the lease away from the folks operating there now. They are wonderful people and don't deserve the hassle. If they stop his lease, they could also stop the hunting there. Yer fun stops when yer elk drops! I've never hunted Colorado, but started in Wyoming's Bighorns in '75 and traveled there to hunt with my oldest hunting bud, who moved out there in '76, until 1999. Mulies in the Bighorns and elk in the western Bridger-Tetons. It's damn tough hunting, but the best days of my hunting life. Since then, my left knee was replaced 3 years ago, and the right is rapidly heading in that direction. My friend is still there...retired LEO...and has his own horses. But I doubt I'll ever go back.